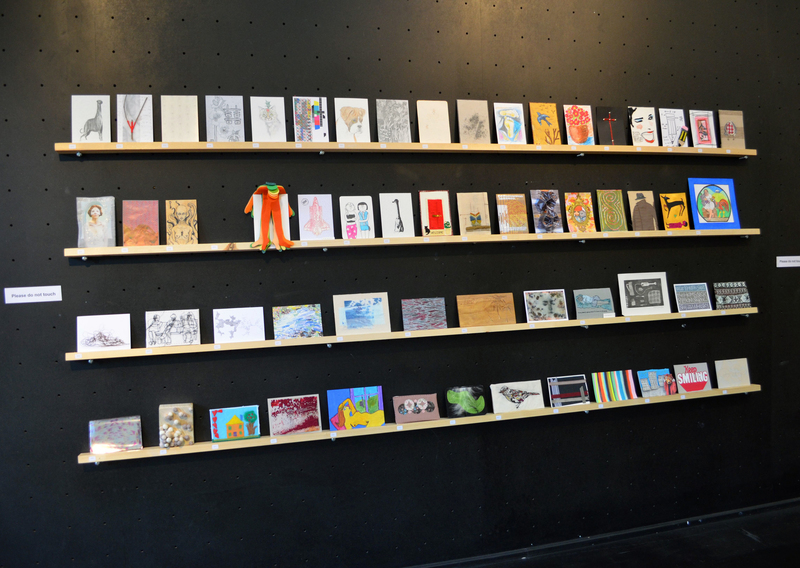 The names of the artists are now revealed beside each postcard size work! 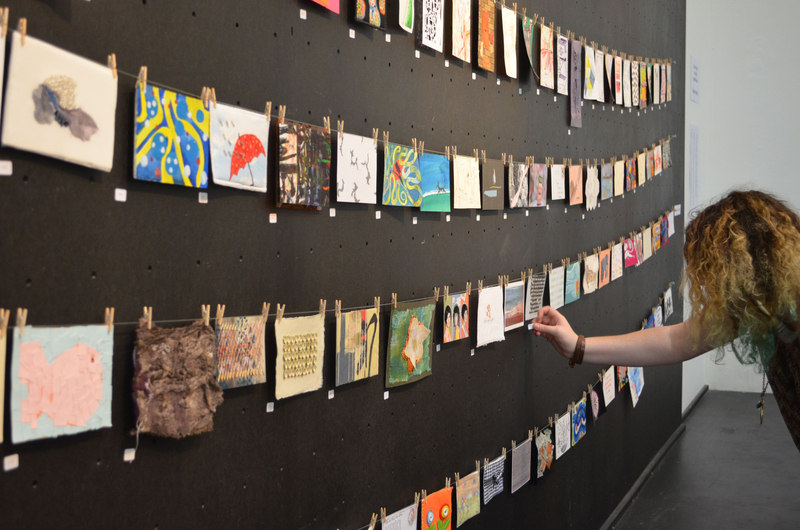 We want to thank everyone for contributing work to our fund raising exhibition, which has been a great success! So far we’ve raised nearly £1600, which exceeded all our expectations so a big thank you to everyone who donated or bought work and some people did both! The highest bid was £60, which was paid for number 130 by Matthew Harris. With additional funds already raised we now have enough to pay for business cards and postcards to promote our work at the degree show and beyond. It is a great help that we don’t have to continue fund raising through the final term and can focus on working for our degree show. This certainly wouldn’t have been possible without your contribution. We will shortly be updating the blog to display the artist’s names beside each postcard size work. Bidding by email has now closed. Thank you to everyone who placed a bid! You will be notified by email on Friday 9th December if you have placed a winning bid. Good Luck! Bids by email close in fifteen minutes, so get your bids in before it’s too late! Good luck! To view all the postcards, click on ‘Older Posts’ at the bottom of the page. From there you will be able to click through all the pages using the ‘Older Posts’ and ‘Newer Posts’ links – there are quite a lot of pages, but to return to 001 click on the 5.8 x 4.1 logo at the top of the page. The exhibition went up on Monday and bids have already started coming in. Here’s a few pictures of all the postcards; we received 169 in total! The bottom picture shows all the notes we received from the lovely contributors. Everyone was extremely happy to be involved and wished us well with the exhibition. Bidding has now opened, so if you see a postcard you would like to bid on, just send us an email at fivepointeightbyfourpointone@hotmail.co.uk containing the postcard card number, the amount you would like to bid, your name and your telephone number. Bids start at £10. Postage and packaging will be charged at £2.99. You will be notified by email on 9th December if you place a winning bid. 5.8 x 4.1 Exhibition has been organised by final year embroidery students at Manchester Metropolitan University to raise funds for career development by promoting their work to future employers. We asked various artists, particularly those who use stitch, to contribute postcard size work and we have been delighted by the response. Some of the contributors are distinguished in their field including members of staff at Manchester School of Art. Many of the exhibits have been donated by artists we know or whose work we have seen and been inspired by as well as by students at MMU. The exhibition includes work by professional and self-taught artists and we have been touched by the generosity of people wanting to support us on our creative path. We recently received work donated by artists in Kosovo and a textile group in Portsmouth.